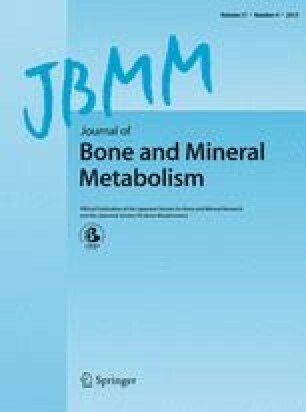 Being aware that age at menarche, age at menopause, and length of fertile period influence bone mineral density (BMD) in the early postmenopausal period, we have failed to find any earlier studies where such an influence on the axial skeleton has been studied in old age when the incidence of hip fracture starts to increase. A large cohort of women, all 75 years old (n = 1044) participated in the Malmö Osteoporosis Prospective Risk Assessment (OPRA) Study. The BMD of the lumbar spine and femoral neck was assessed by a dual-energy X-ray absorptiometry (DXA) technique. Age at menarche and at menopause was recalled with a questionnaire. Also, data on estrogen medication was collected. We found that, after excluding ever-users of potent estrogens (n = 49), there was a small but significant correlation of early menarcheal age with high BMD of the lumbar spine (r = −0.08; P = 0.017) and femoral neck (r = −0.10; P = 0.002) at age 75. Excluding the extremes (5% of the women) with very early or very late menarche, age at menarche no longer influenced the BMD in old age (r = −0.06; P = 0.113). Age at menopause had no influence on the BMD of the lumbar spine (r = 0.04; P = 0.246) or femoral neck (r = 0.00; P = 0.985), at age 75. The length of the fertile period did not influence BMD in old age. The influence of menarcheal or menopausal age on BMD at age 75 was not substantially altered after including body mass index (BMI) in a multiple regression model. Age at menarche or menopause seems to be of limited or no importance as a risk factor for osteoporosis when subjects are age 75 or older.